I am looking forward to engaging with you this year in my new role as President of the Washington State Healthcare Executive Forum (WSHEF). 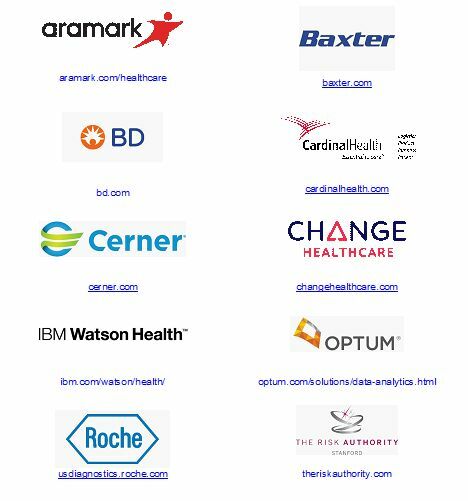 We are leading in a very pivotal time in healthcare and there has not been a time where collaboration with our peers has been more important. I am very interested in hearing your thoughts and ideas as to how we can best meet your educational and networking needs, and support one another in our challenging healthcare roles. Many thanks to all of the above individuals for their many volunteer hours and hard work on the Chapter’s behalf – we are fortunate to have such strong leadership for our Chapter. The Board members got together for a retreat in January. We discussed how we could better engage with our members in the coming year, try out some new ideas, and reach out more intentionally to engage with you. We will be asking for your support and help in our efforts in the coming months. We want to make sure all of our Washington healthcare organizations throughout the state are represented on our Board and committees. If you are interested in participating on the Board or a committee, we would love to hear from you. WSHEF was recently notified by ACHE that we received a Chapter Merit Award (annual award given by ACHE to Chapters who excel in various areas). Our award was related to the % of members advancing to Fellow status in our state. Congratulations to all of you who advanced to Fellow in 2017! I interacted with a few healthcare executives pursuing the FACHE credential in 2017– each one talked about the desire to be lifelong learners and that ACHE truly is the preeminent health care organization for staying in tune with trends in healthcare management. If you are eligible to advance (and if you don’t know – please ask), make 2018 the year that you pursue the FACHE credential. •	We are looking for volunteers to help with our Program Committee, Membership & Advancement Committee, and Communication Committee. This could include helping out with one upcoming event or activity, or a commitment to join the committee long term --- please let me know if you are interested and we can connect with you for a brief conversation about opportunities. •	We are also interested in learning more about how we can best engage with our physician members and will be reaching out to them to get their input. If you are a physician healthcare leader, please let us know if you are interested in helping with our efforts – as an advisor or active committee member. •	A reminder about the upcoming ACHE Congress meeting March 26-29 in Chicago. The theme this year is “Be Part of Something Bigger “- I hope you plan to attend. There is a lot of inspiration around us with the Winter Olympics in our rear view mirror and the 2018 Congress on Healthcare Leadership coming up in Chicago March 26 - 29. The Olympics always remind me of the balance of body, will, and mind. Watching our athletes compete teaches us tenacity, accepting failure, and getting back up and going after it again. May we all help our patients find the athlete in them as we work to improve the health of our populations. If you are not able to join us in Chicago visit ache.org to subscribe to the Inside Congress blog or follow @ACHEConnect on Twitter and #ACHECongress. Our annual meeting is a great opportunity to connect with leaders from around the country (and the world) and to reconnect with our graduate programs that often host alumni events the week of Congress. I close with hearty congratulations to the Washington State Healthcare Executive Forum (WSHEF) for receiving a Chapter of Merit award from ACHE. The chapter is recognized for advancement programming and having a record number of eligible members advance to Fellow. If you have been thinking about board certification and keep putting it off - make this your year to add FACHE to your name! When asked the question of what he wanted to be when he grew up, a career in healthcare was the last thing that Martin Benning would previously answer. A long battle with childhood cancer pushed Martin away from healthcare, and down his initial path of pre-law at the University of Washington. However, Martin says a job at the Seattle Surgery Center during college is when he began to “fall into healthcare.” His initial exposure in combination with his past patient journey in healthcare are what eventually drew him back in and brought him to where he is today. Through his personal and professional experience, Martin states that he has always put physicians on a pedestal and is part of why he loves what he does so much. While he admits that care delivery has never been for him, being able to support them from an operational level has helped him to continually show his appreciation to caregivers and physicians. He is constantly looking for ways to align administrative visions with those of the providers, recognizing common goals and working to explicitly address the “why” behind these goals. Martin is beginning his role as the Vice President of Clinical Operations and Market Integration for Washington Kaiser Permanente in the South Service area. Whether through quality and process improvement, or his current role, he has always worked in an operational role to some capacity. Throughout his career, he has appreciated the networking opportunities that ACHE has provided him as fellow. He recognizes the value in speaking a common language as his peers in this organization, and through his years as a fellow, has found that it creates a rapport among colleagues who are like-minded in their commitment to the healthcare industry and profession. Thanks to Kelly Lalita Mohammad, MHPA candidate WSU for Fellow Spotlight article. WSHEF Advancement Committee Needs You! Fellows Only Event – These events are tailored to members that have attained the Fellow certification in the American College of Healthcare Executives. Help or lead the selection of a sponsor, venue, speaker and other logistics to host another outstanding opportunity for ACHE Fellows to network and gain additional healthcare knowledge. In the past, proceeds of these events have gone to the Foundation for Healthcare Excellence. Advancement Information Sessions – Are you a recent Fellow in the American College of Healthcare Executives? Are you interested in getting the next batch of members motivated to work toward their own Fellow credential to demonstrate excellence in healthcare management? Then consider volunteering to lead or assist with the development of Advancement Information Sessions every three to six months. Ideally these session or webinars will provide 1.5 hours of information on the steps for a member to take to move to the next level as a certified healthcare executive with the ACHE Fellow designation. Board of Governors (BOG) Exam Study Group – Getting ready for the BOG exam to apply toward your Fellow credential with ACHE? Consider a study group to help motivate and guide your preparation. Study groups will follow the format of the ACHE preparation guides and have periodic online meetings as determined by the group. The groups share the initial preparation of the discussion using the ACHE recommended materials. As an added bonus, each member that successfully passes the BOG exam within a year of the end of the Study Group can submit the receipts for the ACHE study preparation books and receive a $240 refund. Board of Governors Exam Study Group Facilitator – One member of the study group who is interested in running the study group can also apply to be a study group facilitator. If selected, the member will have the ACHE exam preparation webinar series and the preparation books covered by the chapter. The facilitator will help arrange the study group meetings and assignments. The group normally rotates taking lead on each topic to be covered at study group meeting. Virtual meetings will be encouraged to allow for remote BOG exam candidates to be able to participate. 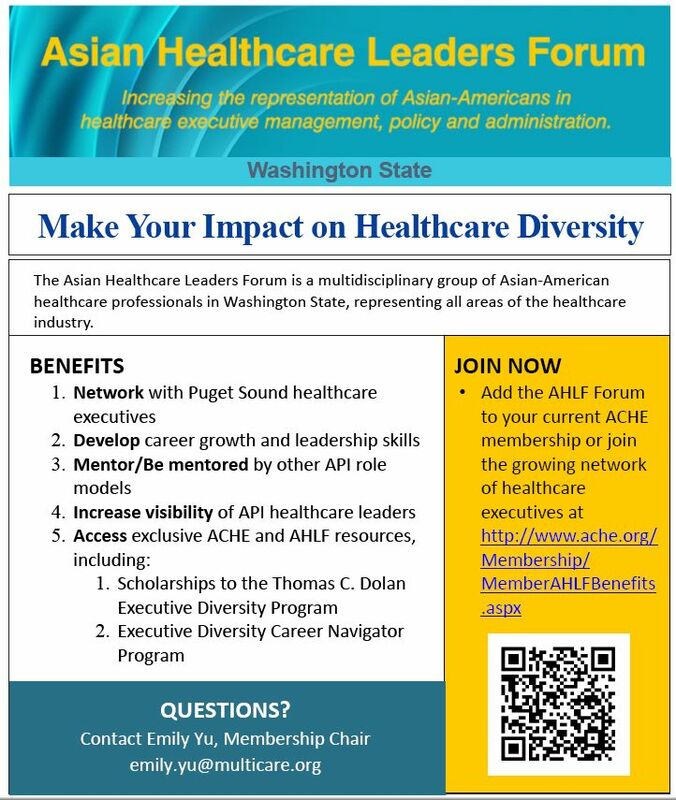 Asian Healthcare Leadership Forum is looking for you! Instead, many healthcare organizations are focusing on trends that can make a tangible, positive impact. According to 50 percent of the CIOs surveyed, these promising innovations include Fast Healthcare Interoperability Resources and application programming interfaces. Additionally, 14 percent of CIOs said their organization has launched a dedicated IT innovation center and 25 percent said their health system has formed a partnership focused on innovation with a healthcare IT startup. —Adapted from “FHIR transformative, blockchain overhyped, CIOs say,” by Mike Miliard, Healthcare IT News, Jan. 19, 2018. At the start of 2018, the healthcare industry is on the cusp of more significant change, according to a recent Health Affairs Blog post. Highlighted below are six trends to be on the lookout for. The healthcare reform strategy of Republicans going forward will likely be to focus on the states, granting them waivers to experiment with insurance programs and expand Medicaid coverage. That said, healthcare leaders are viewing 2018 as a year of greater insurance market stability. On the other hand, bad debt continues to climb, which means some healthcare leaders still face major financial threats. CMS will likely continue to ramp up the Medicare Access and CHIP Reauthorization Act of 2015 that incents clinicians to take risks with alternative payment models. Private sector actions also appear to be expanding and accelerating the value-based payment movement, disrupting the status quo. To ultimately succeed, health leaders realize that they need to, above all else, excel at attracting and engaging patients, families, caregivers, and consumers. More and more, providers will work with patients, families and caregivers to develop approaches to more actively manage their health and healthcare. Healthcare leaders have a larger and more urgent financial imperative to identify and isolate wasteful practices, cost outliers and the root causes for inefficiencies. These efforts will rely heavily on having accurate and actionable data and analytics. Congress and the FDA will continue to explore new initiatives designed to unleash more competition that can moderate drug price trends. Efforts could include developing more generics where competition is lacking, streamlining the generic drug approval process, eliminating loopholes that prevent the introduction of competitor drugs and promoting biosimilars. While providers wait for new interoperability provisions, they continue to build data warehouse systems, enhance data analytics, and train their workforce on IT-related competencies. —Adapted from “What To Watch In Health Care In 2018: Six Key Trends,” by Susan DeVore, Health Affairs Blog, Jan. 29, 2018. ACHE’s Career Resource Center is pleased to bring you an enhanced version of the Executive Coaching Directory. Executive coaches offer personalized support to individuals pursuing professional growth. While ACHE is not endorsing the firms or individuals listed, we hope that our directory accelerates your research process as you assess the qualifications, practice methods and fees of an array of executive coaches. Not only does this upgrade provide a better experience for members seeking executive coaches, the coaches promoting their services benefit as well. Enhanced search capabilities for members seeking an executive coach. You can now search coach profiles based on location, area of expertise and more! Improved profiles, including the listed coaches’ website, social media outlets and a professional headshot. Advanced technology that provides members and coaches with a more user-friendly experience. Check out the Executive Coaches Directory today! If you have questions or need assistance, please contact us at coach@ache.org. The Senior Executive Program is tailored for senior leaders, providing them with an opportunity to gain skills in decision making, problem solving and team building. Participants explore crucial topics impacting the healthcare environment, how to lead an organization to success and ways to achieve lifelong learning goals. Enrollment is limited to 30 healthcare executives, and participants must attend all three sessions. A limited number of scholarships are available for qualified individuals. For more information, contact Catie L. Russo, program specialist, in ACHE’s Division of Professional Development, at (312) 424-9362, or visit ache.org/SeniorExecutive. The Executive Program is tailored for mid-level managers, providing them with an opportunity to assess their skillsets in order to develop stronger leadership capabilities and prepare them for change within their organizations. Participants explore a wide range of topics essential to their professional career growth and their healthcare organization’s advancement. Enrollment is limited to 30 healthcare executives, and participants must attend all three sessions. A limited number of scholarships are available for qualified individuals. For more information, contact Catie L. Russo, program specialist, ACHE’s Division of Professional Development, at (312) 424-9362, or visit ache.org/Executive. The Board of Governors Exam fee waiver promotion for ACHE Members to save $200 when they submit their Fellow application will take place between March 1 and June 30, 2018. Eligible members must submit their completed Fellow application, $250 application fee and meet all requirements—including the three years of ACHE membership tenure and five years of executive-level healthcare management experience—by June 30 in order to receive approval to take the Board of Governors Exam. Pending application approval, ACHE will waive the $200 Board of Governors Exam fee. When you share the value of ACHE membership with your colleagues through encouraging them to join or advance to Fellow status, you can earn points to obtain rewards such as a gift certificate toward an ACHE education program, a polo shirt, a backpack tote, a water bottle and an umbrella. If you sponsor three or more Members who successfully achieve Fellow status, you can even be entered into a raffle for a free registration to ACHE’s Congress on Healthcare Leadership. Each time a person joins ACHE or advances to Fellow status and lists your name as a sponsor on the application, you earn a point. The more points you earn, the more rewards you can receive. Points expire on Dec. 31 of the year following when they were earned (e.g., a point earned on Jan. 1, 2018, will expire on Dec. 31, 2019). You can check your available points and discount program coupon codes in the My ACHE area of ache.org. To ensure colleagues reference you, referral cards are available that you can pass out so you receive the credit you deserve. When you help grow ACHE, you make a strong statement about your professionalism and leadership in the healthcare field and also strengthen the organization. For more information on the program, go to ache.org/L2L. ACHE offers four community groups that align with our members’ professional backgrounds and commitment to diversity and inclusion. Make members in your area aware of these communities and encourage them to join one or more that meet their professional needs and goals (pending they meet the requirements). Sign up today: Join or renew one or more of these groups for an annual fee of $100 each in addition to your ACHE membership dues. All benefits are accessible online and include a newsletter, an exclusive LinkedIn Group and special designation in ACHE’s online Member Directory. Improve your visibility in the healthcare field and build your professional brand by sharing career updates with ACHE. Have you started a new job or been promoted recently? Are you planning to retire? Let ACHE know for a chance to be listed in the "On the Move" section of Healthcare Executive magazine! All you have to do is email the job title, organization and location of both your former and your new job, as well as a high-resolution headshot, to he-editor@ache.org. Candidates for Chairman-Elect and Governor should submit an application to serve that includes a copy of their resume and up to 10 letters of support. For details, please review the Candidate Guidelines, including guidance from the Board of Governors to the Nominating Committee regarding the personal competencies of Chairman-Elect and Governor candidates and the composition of the Board of Governors. Candidates for the Nominating Committee should only submit a letter of self-nomination and a copy of their resume. All correspondence should be addressed to Edward H. Lamb, chairman, Nominating Committee, c/o Julie Nolan, and the applications to serve and self-nominations must be submitted electronically to jnolan@ache.org and received by July 15, 2018. The first meeting of ACHE’s 2018–2019 Nominating Committee will be held on March 27, during the 2018 Congress on Healthcare Leadership in Chicago. The committee will be in open session at 2:45 p.m. During the meeting, an orientation session will be conducted for potential candidates, giving them the opportunity to ask questions regarding the nominating process. Immediately following the orientation, an open forum will be provided for ACHE members to present and discuss their views of ACHE leadership needs. Following the July 15 submission deadline, the committee will meet to determine which candidates for Chairman-Elect and Governor will be interviewed. All candidates will be notified in writing of the committee’s decision by Sept. 30, and candidates for Chairman-Elect and Governor will be interviewed in person on Oct. 25. To review the Candidate Guidelines, visit ache.org/CandidateGuidelines. If you have any questions, please contact Julie Nolan at (312) 424-9367 or jnolan@ache.org. On behalf of the Fund for Healthcare Leadership, we thank all of our generous supporters for their commitment to ACHE’s mission to advance our members and healthcare management excellence. Over 2,800 outstanding individuals and organizations have joined our growing list of leaders who care. Among that distinguished group, Catholic Health Initiatives (Kevin E. Lofton, FACHE), John M. Haupert, FACHE, HCA, John J. Lynch, III, FACHE, Memorial Hermann Health System (Charles D. Stokes, FACHE), Navicent Health (Ninfa M. Saunders, FACHE) and New York-Presbyterian (Michael J. Fosina, FACHE) opted to make an even bigger impact on the future of healthcare by committing to a major gift in 2017. Your commitment helps the Fund for Healthcare Leadership provide scholarships for ACHE’s Senior Executive and Executive programs, as well as back the Thomas C. Dolan Executive Diversity Program. The Fund looks forward to more opportunities for outreach in 2018. ACHE’s 10 Premier Corporate Partners play a vital role in supporting ACHE’s vision of improving health, including the creation of a culture of safety. These corporations provide funding that helps ACHE develop relevant, timely programming, career resources, enhance networking opportunities, and provide additional educational lectures at our Clusters and special programs. Through their support, the Premier Corporate Partners are fostering innovative solutions to the challenges healthcare leaders face and helping to transform healthcare through the delivery of safe, effective and efficient care. By partnering with ACHE, these companies are clearly demonstrating their commitment to supporting ACHE’s patient safety initiatives and supporting your growth as a leader in an era of transformative change. The University of Washington's Graduate Programs in Health Services Administration offers healthcare professionals two options for increasing their management and leadership skills: the Executive Master of Health Administration Program (MHA), and the Certificate Program in Medical Management (CPMM). Both programs are designed for those who want to meet the need for skilled leaders in the ever-changing healthcare delivery system. Physicians, nurses, other experienced clinical practitioners, and health service managers enter these programs to become more effective leaders and meet the increasingly challenging expectations of the patients and families, stakeholders, and communities they serve. The Executive MHA Program has a 24-month format that combines three-day intensive on-site meetings with teleconferencing, independent assignments and team projects. Applications for admission have an annual deadline of April 30. For details, visit: http://www.uwexecutivemha.org. To ask questions about either program, contact Maggie Helsel, the program coordinator, at mhap@u.washington.edu or 206-616-2947. If it is time to futher your education and earn a master's degree in health policy and administration, WSU offers an exciting program designed around a working professional's schedule. The Master of Health Policy and Administration (MHPA) degree is a vigorous, CAHME accredited, and personalized program that prepares future leaders in the dynamic and growing field of healthcare management. WSU HPA students enjoy small class sizes (12-20 students), which facilitate opportunities for strong and lasting relationships with both peers and professors. Students are required to participate in individual and group based projects and be actively engaged in class discussions. Additionally, students are provided valuable professional connections by networking with local healthcare professionals through site visits, guest lectures, student body events, and alumni events. A hallmark of the MHPA program is the completion of an internship. The required internship allows the student to gain leadership experience in the health care environment, explore the field, develop professional contacts, and contribute to career planning. The Department of Health Policy & Administration will help the student find an internship that meets your needs, or the student may arrange their own internship. Graduates of the program work in a wide range of career fields including hospital management, public health, managed care, group practice management, and financial management. Since 2013, 90% of WSU MHPA graduates secured employment within 3 months of graduation! The program is ideal for working health care professionals who want to enhance their management skills or advance to management positions. To attract and accommodate our working professional students, our classes are offered from 4:00 p.m. to 6:30 p.m., four days a week. Additionally, the program accommodates both full-time and part-time students. WSU Spokane’s Department of Health Policy and Administration is a proud member of the Western Interstate Commission for Higher Education (WICHE) which provides waivers for out-of-state tuition in 16 states. For more information regarding WICHE, please visit www.wiche.edu. To learn more about the MHPA program, visit: http://spokane.wsu.edu/admissions/HPA/ or contact the Academic Coordinator, Robin Durfee, at robin.durfee@wsu.edu or 509.358.7987. Ready to Advance to Fellow? Why Board Certification - You want to go to board certified physicians for your care, so why not go to an organization with board certified healthcare executives. Earning the distinction of board certification as a Fellow of the American College of Healthcare Executives demonstrates your competence, dedication and commitment to lifelong learning. To learn more, visit ache.org and then go to the credentialing page. Advancement Information Session - Do you want to learn more about the value of board certification and the steps to completion? Then come to the Advancement Information Session sponsored by the Washington State Healthcare Executives Forum. There are two ways to participate. In-person or at your desk through a webinar. These sessions will be held twice annually. For more information about future information sessions you can contact Steve Saxe at smsaxe@comcast.net. To reduce the barriers to ACHE educational programming for ACHE members experiencing economic hardship, ACHE has established the Tuition Waiver Assistance Program. All requests are due no less than eight weeks before the program date, except for ACHE self-study courses; see quarterly application deadlines on the FAQ page of the tuition waiver application. Incomplete applications and applications received after the deadline will not be considered. Recipients will be notified of the waiver review panel's decision not less than six weeks before the program date. For ACHE self-study courses, applicants will be notified three weeks after the quarterly application deadline. If you have questions about the program, please contact Teri Somrak, associate director, Division of Professional Development, at (312) 424-9354 or tsomrak@ache.org. For more information, visit ache.org/TuitionWaiver. We are pleased to provide a link to the WA Healthcare News Job Bank. This is an excellent source of information about positions in our local geographic area. The available position list has also been extended recently to contain some positions in other parts of the country. Thank you to our Chapter Sponsors! Foster Pepper PLLC’s health care practice is a principal focus of our firm and consistently recognized as a top practice by U.S. News-Best Lawyers “Best Law Firms” survey. The firm’s attorneys are experienced in virtually all areas of health care and life sciences law, including governance and organization of public and private hospitals, human subjects research, medical staff issues, regulatory compliance, state and federal tax and tax-exempt issues, structuring joint ventures, and transactions. We are proud to represent several hospitals around the region, as well as serving as special or general counsel to most of the public hospital districts in the state. Ogden Murphy Wallace, P.L.L.C. is a leading multispecialty law firm committed to providing practical, cost-effective legal services to businesses, municipal entities, and individuals. The firm has served Pacific Northwest clients for over 100 years, providing valuable legal services as our clients' affairs have prospered and expanded. To be the premier professional society connecting leaders in Washington State to learn, share, and transform health care. To advance Washington state ACHE members' healthcare professional excellence through interaction and communication and fostering professional development. We advocate and emulate high ethical conduct in all we do. We recognize lifelong learning is essential to our ability to innovate and continually improve ourselves, our organizations and our profession. cornerstone of our professional interactions. and the communities we serve. development within and outside of our healthcare community. Looking for ways to connect with more healthcare leaders? 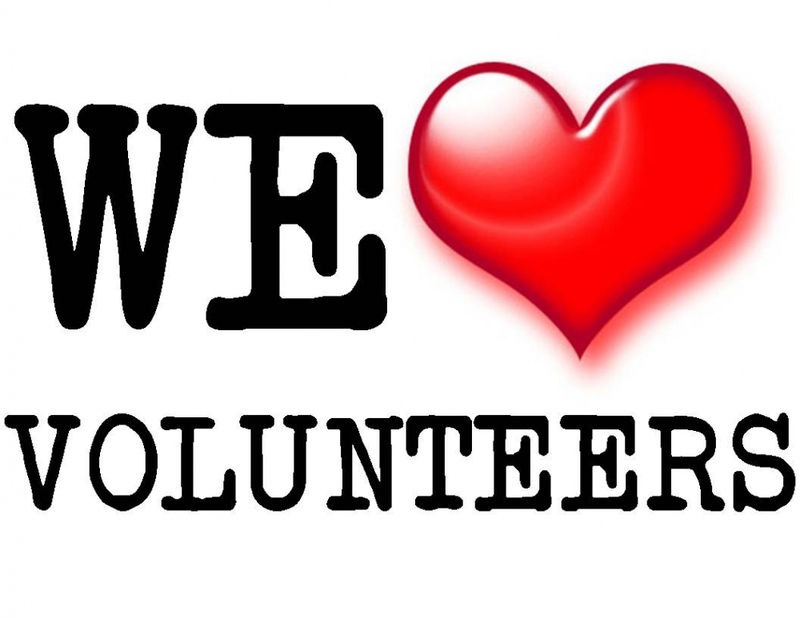 Volunteer for a WSHEF committee! If you’re interested in volunteering with the Programs Committee, please reach out to Programs Committee Co-Chairs at wshef.membership@achemail.net. Beyond joining a committee, there are other ways to get involved. Write an article for the newsletter, attend an educational session and bring a colleague, provide a venue for an event or serve as a mentor for an MHA student. Just email one of the contacts above to get connected. • Have you wondered if there are ways you can meet more of your local healthcare colleagues – that mysterious thing called “networking”? • Are you looking to find a next role? You looking for the right candidate? • Is there a problem you are tackling at work and wonder if others are working on a similar issue? Or are you just looking for others who will understand what the heck you are talking about? • Know where all the local healthcare execs hang out after work? The highly popular Meet-N-Mingle events are happening at different venues across our state. As future dates and locations are finalized, an invitation will be sent out. Meet-n-Mingles are informal gatherings of area WSHEF members at a local restaurant or pub. There is typically a small fee to cover appetizers. While this is not a formal education program, someone will be there to share upcoming WSHEF and ACHE events and activities. By the way, we are always looking for local hosts around the state and we will help you do all the planning. If you have an interest in holding a future Meet-N-Mingle in your area let the membership committee know at wshef.membership@achemail.net. Thanks, and get networking people! Effective January 1, 2008, all ACHE members located within the chapter's assigned geographic territory are automatically members of the chapter as a benefit of being an ACHE member. Only ACHE members are eligible to hold membership in the chapter. If you are not a current ACHE member, we encourage you to join by visiting the ACHE website. Nonmembers are welcome to attend chapter events. If you would like to be added to the chapter's nonmember mailing list to be notified of future programs and events, please send an email to info@wshef.ache.org.